Meteorological Spring Starts March 1st. Winter is running out of time whether you measure it by the 3 coldest months (Meteorological Winter), which ends tonight Feb. 28th at midnight or astronomically with the Vernal Equinox on March 20th. The sun is getting stronger every day, and will have an impact on our weather later this week when we should reach 40 degrees for the first time since the 24th of January. The massive spinning area of low pressure over the northeastern United States is slowly weakening, but it is not quite through with us yet. The moisture entrained in the system will continue to maintain a solid to broken deck of stratus clouds over the Stateline though late Monday night. The last in a series of disturbances will rotate in from the north on Monday bringing a chance of some light snow and flurries across the area. No measurable snow is expected. A huge Canadian high currently over Hudson Bay begin to take control of midwestern weather on Tuesday drying the atmosphere down to the point where skies will be partly sunny. This high pressure center is not exceptionally cold, so high temperatures will just be a little below average through midweek, but will warm a little each day to the point where 40 degrees will likely occur as we head into next weekend. One thing that you will notice as week get into midweek, Thursday, and Friday will be all the sunshine. It is bound to give you a lift in your spirits. The modified Canadian high will be sitting right on top of Illinois on Friday, and shift to eastern Kentucky by Saturday. Once it moves to the east skies will begin to pick up some clouds again on Saturday and Sunday, but it should be fairly mild with highs in the low 40's over the weekend. The weather flow across North America is jammed up. High pressure in the upper atmosphere over northeast Canada is blocking a major storm over the northeastern USA. Record amounts of snow have been reported over parts of New York state and New England. Moisture from the Atlantic Ocean is being drawn around the north side the massive low and thrown back toward the west into the Great Lakes, and the midwest. The net effect for our area will be mostly cloudy skies tonight and Sunday. These clouds are stuck between the back side of the low pressure and a ridge of high pressure reaching from Canada across the plains states. There will be a big difference in temperature ovenight where the back edge of the clouds lines up north to south. To the west, where skies will be mostly clear overnight in eastern Iowa temperatures may drop into the single digits, and to the east over north central Illinois and futher east lows will be in the middle 20's. A Canadian cold front stretching westward from Hudson Bay, and a disturbance associated with the front, will sweep across the area from the north on Monday. This should be the final disturbance associated with the weakening major low in the north eastern states, and it will only bring a chance of flurries on Monday. After the system passes through skies will become partly cloudy on Tuesday, and mostly sunny to sunny for the rest of the week as high pressure takes charge of our weather. There will be a slow warming of temperatures with a good possibility that the 40 degree mark will be reached on Friday or Saturday. Sunday February 28th marks the end of meteorological winter. With the slowly warming temperatures, and lots of early March sunshine next week it will begin to feel a little more like spring, even though we still have snow on the ground. Be sure to stop by the First Warn Weather Blog for more information! Have a great Sunday! An 8.8 magnitude earthquake struck Chile at 3:34am Saturday morning causing tsunami warnings to be posted for many areas in the Pacific, including the islands of Hawaii. Over 100 people have died and that number could rise as the day goes on. The epicenter was about 70 miles from Concepcion and caused the Santiago airport to be shut down. Residents continue to experience aftershocks, some as strong as 5.0 or higher. South America, Hawaii, Australia, Japan, the Philippines, Russia and many Pacific Islands are all at risk of tsunamis. Alaska and the US West Coast are at risk as well, according to the Pacific Tsunami Warning Center. For more information on the earthquake, go to the USGS website. For more information on the tsunami warnings, go to the Pacific Tsunami Warning Center's website. The estimated arrival time of the first tsunami wave to hit the Hawaiian coast will be around 11:05 am HST. It is still uncertain as to exactly what extend the wave will be. Keep checking back for the latest on the earthquake in Chile and the impacts on the Pacific coasts. Tidal surge being reported in Ventura, CA, with some beach erosion. Buoys swept away but no boats. Pacific Tsunami Warning Center confirming 5.5 foot tidal surge at The Big Island and now the water is beginning to recede. No damage has been reported yet. Surges in water continue to move in, but no significant waves are being reported. Reports coming in of discoloration, receding of the water and strange tides coming in from Hilo Bay, Hawaii. I know it's hard to think about, but February 28th - March 6th is Severe Weather Preparedness Week in Illinois! It's important for you to develop some type of safety plan for your home, school or office in the event severe weather were to strike. All next week during the WTVO Morning News we will talk about how to keep you and your family safe during severe weather. For more information on Illinois Severe Weather Preparedness Week, visit the National Weather Service website or Illinois Emergency Management Agency website. If we include the two other days where we were right at 40° (December 25th and January 14th) then we've only had six days with 40° or above. When is spring coming? Rain, snow and flooding are once again concerns for folks along the Northeast coast today. An area of low pressure developing along the Carolina coast this morning will continue to gather strength as it moves east and combines with another low in the upper levels of the atmosphere. This will create a surface low to develop, intesify and become almost stationary over southern New York tonight and Friday. Heavy snow can be expected through parts of Pennsylvania and into New York State. Some of those areas could pick up a foot or two of heavy, wet snow! Not only are residents going to have to deal with the snow - rain, coastal flooding and high winds will also come to play. Winter Storm Warnings, Watches, Advisories as well as High Wind Watches have been posted for much of the New England coast. Ironically, the storm that is causing headaches out east could have an impact on our weather this weekend. We talked about it earlier this week and how the low will move back west into the Eastern Great Lakes and keep the clouds around. Temperatures through the weekend will stay below average with highs in the low to mid 30s. Who Needs a little Laugh? "One winter morning a husband and wife in Regina were listening to the radio during breakfast. They heard the announcer say, "We are going to have 8 to 10 inches of snow today. You must park your car on the even-numbered side of the street, so the snowplows can get through." So the good wife went out and moved her car. A week later while they are eating breakfast again, the radio announcer said, "We are expecting 10 to 12 inches of snow today. 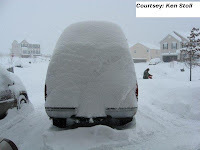 You must park your car on the odd-numbered side of the street, so the snowplows can get through." The good wife went out and moved her car again. The next week they are again having breakfast, when the radio announcer says, "We are expecting 12 to 14 inches of snow today. You must park....." Then the electric power went out. The good wife was very upset, and with a worried look on her face she said, "Honey, I don't know what to do. Which side of the street do I need to park on so the snowplows can get through?" With the love and understanding in his voice, the husband replied, "Why don't you just leave it in the garage this time?" The snow that fell this morning will continue to move to the east as skies try to clear behind it. It's kind of hard to tell with the snow on the ground (because visible satellite can pick up snow cover) but mostly clear skies stretch from just west of Rockford to eastern Iowa. That should allow temperatures to reach the low 30s this afternoon. A cold front, however, will move in later in the afternoon/evening and bring clouds and light snow back once again. Behind the front temperatures will drop like a rock with highs only reaching the low 20s Wednesday afternoon. Anyone Else tired of Snow? Raise your hand if you're tired of snow and ready for spring! Unfortunately, it looks like we'll stay with this winter pattern for atleast for the next two weeks. Light snow this morning may cause some slick spots so watch out for that. Snow will continue to move off to the east this morning with a little clearing possible late morning and early afternoon. An arctic front comes sweeping down the plains later this afternoon and evening - brings more snow but well below average temperatures Wednesday and Thursday. BOO!!!! The storm system that produced 2.9" of wet snow at the Rockford Airport last night has moved on out of the area, and is currently over the eastern Great Lakes. A broad trough of low pressure is hanging back from that system, arcing across Ohio, southern Michigan, east central to northwestern Wisconsin. That trough is resposible for an area of light snow and flurries across much of the southwestern half of Wisconsin this evening. The southern edge of that area of snow has pushed into northern Illinois. As of 8 pm the temperatures were still at 32 degrees in Rockford, so the light snow has been melting making area roadways wet. If the light snow persits, along with temperatures dropping down into the upper 20's before midnight, there is potential for some roads to become slippery. Keep that in mind if you are planning any automoble driving during the next few hours. The next significant weather feature to be watched is a speed max, and a mid level disturbance associated with the intensifying polar jet stream over Saskatchewan in the prairie provences of Canada. The next arctic front to push through the Stateline will be accelerated southeast with the assistence of this strong jet. It will move a polar cold front through the Stateline late on Tuesday afternoon or early Tuesday evening. There will be considerable lift associated with this system as in moves in from the northwest, and snow showers will be generated on Tuesday afternoon and Tuesday night. Some of those snow showers may be heavy enough for brief periods of time to reduce visibilites, gusty winds, and give a quick coating of 1/2" of new snow in spots. As the jet progresses southeast it will spin up a new upper closed low over the western Great Lakes. This will help continue the chances of more snow showers through Wednesday. A northerly wind flow will develop across areas to the west of the strong upper low bringing very cold air into the Stateline on Wednesday and Thursday. With Canadian high pressure centered over the midwest we will have clear and cold nights on Wednesday and Thursday with lows in the single digits. Daytime highs will only be in the low to middle 20's, when average temps should be in the middle 30's, but the redeeming factor is that there will be lots of sunshine. Temperatures will slowing moderate into next weekend , but will still be a little on the cool side. I'm sure a lot of you were left wondering what happened to all the snow that was forecasted this past weekend. Well, there were a few things at play. Most areas in the Stateline picked up between 2"- 4" with higher amounts through west central Illinois and lesser amounts into southern Wisconsin. Probably one of the biggest factors was that the low stayed further to the south and had more of an easterly track rather than northeast track. If the low would have moved a little further north we may have seen higher totals. Also, the low didn't deepen as much as originally thought and was actually moving quicker than previously forecasted. Another factor was that the snow that fell was a heavier, wet snow. That did cut down on totals because as the snow fell it compacted more than if it would have been a drier snow. Finally, temperatures through the duration stayed pretty much at or a little above freezing allowing a little more of a mix in the beginning in some locations. If this would have been a storm during late December or January we could have very well been digging out more than what we were for this morning. Since we are getting later in the season these types of storms have to be watched because a lot of times they just don't pack as much power with them as "middle of winter" storms tend to do. Although there can be "late bloomers" that produce hefty totals. 10:25am: Clinton, Rock Co. - 3.0"
6:27am: 3 S La Grange, Walworth Co. - 1.7"
5:14am: 9 WNW Beloit, Rock Co. - 1.0"
Snow is beginning to wind this morning with most areas receiving between 2"- 4". A few scattered flurries/light snow showers will be possible throughout the day but as the main low continues to move east/northeast snow chances will continue to diminsh. Temperatures today will stay in the low to mid 30s. Light snow will be possible Tuesday and once again Wednesday before cool Canadian air moves in by Wednesday and Thursday. Some roads may be a little slick this morning so be sure to take it easy. The storm that looked like it would evolve into a major winter storm on Saturday night looks less impressive tonight. It's track will be farther off to the southeast of the Stateline, and it looks like it will be weaker than anticipated at this time yesterday. Instead of a track through St. Louis and Champaign, Illinois tonight, it will move from northeast Texas across Arkansas, and into southern Indiana by 6 am Monday morning. That is considerably further southeast than the projected path yesterday, and too far off to the south and east to produce excessively large amounts of snow across the Stateline. That said, moderate amounts of snow are still expected, and a WINTER STORM WARNING has been posted for the counties of north central Illinois until noon on Monday. Snow is spreading into the area from the southwest, and 3" to 5" of new snow are possible overnight. The snow will diminish to flurries by noon on Monday, and the total snowfall with this system is expected to be between 3" and 7". The lesser amounts expected over far northwestern Illinois, with around 6" in the Greater Rockford area. Modified late season arctic air will move in following the departure of the storm on Wednesday with below normal temperatures expected for the of rest of the work week. Temperatures will moderate back up towards normal in time for next weekend. Be sure to check out the First Warn Interactive Radar on our website... Mystateline.com. You can get right into the weather in your local area, and follow the snow as it moves northeast across the area tonight. We will continue to watch the path of the snow storm tonight, and Monday morning, and have updates on our First Warn Weather Blog! It appears as if a late winter storm will hit the Stateline with a significant snowfall beginning late on Sunday continuing through the day on Monday. A WINTER STORM WATCH has been issued for the north central counties of Illinois from 8 pm Sunday night through 12 am on Tuesday. A WINTER STORM WARNING has been issued for Stephenson county, and the rest of northwestern Illinois from 3 pm Sunday afternoon until 6 pm Monday evening. A WINTER STORM WATCH is also in effect for all of southern Wisconsin from Sunday evening through Monday evening. Here is the setup. The southern stream jet is juiced for action. It has been very active through this moderate El Nino winter, and continues to be loaded with energy. A strong short wave is riding along the jet out of Arizona this evening across New Mexico. It will move out of the mountains tonight, across the Texas panhandle on Sunday morning and move through the our region Sunday night and Monday morning. As is moves northeast it will generate a surface low pressure system over Oklahoma by noon on Sunday. It will intensify some as it moves northeast across Missouri by midnight Sunday night. It will be in an ideal position at that time to draw significant amounts of moisture northward into the Stateline Sunday night, and early on Monday. Right now it looks as if the heaviest of the snowfall will occur overnight on Sunday night into the early morning hours on Monday. The National Hydrometeorological Center has outlined the Stateline as the area most likely to receive heavy snow. The NWS office out of the Quad Cities believes that the axis of the heaviest band of snow with this system will extend southwest to northeast from Fairfield, Iowa across the Quad cities to near Freeport. If one were to extrapolate that band to the northeast it would take it across northwestern Winnebago county into Rock county Wisconsin and on towards Milwaukee. The Hydrometeorological Center outlines north central and northeast Illinois and extreme southeast Wisconsin of at least a 10% chance of more than 1 foot of snow from this system. So, it looks like the heavy snow will occur on Sunday night with a good chance of 4" to 7" in the overnight hours. Heavy snow will wind down during the morning hours on Monday with storm totals mostly between 6" and 10" with an average around 8". However, there is that possibility of some localized areas that will get up to 12". Light snow will continue into Monday afternoon, but it will be quite windy with northerly winds gusting close to 30 mph. Even with the wind, excessive drifting of the snow is not expected because of the fairly wet nature of the snow. After the storm exits off to the east, a modified late season arctic air mass will drop down out of Canada providing the Stateline with below normal temperatures for the rest of the work week. With the late February sun shining much of late week, and providing double the solar energy we were getting 2 months ago, it will not seem all that cold. Models have now come somewhat into agreement with the approaching late winter snow storm slated to move through Sunday afternoon and into Monday. An area of low pressure will begin to develop in Texas and strengthen as it moves through Missouri and Southern Illinois by Monday afternoon. As it does, snow will be likely Sunday afternoon/evening due to warm air being pulled northward into Northern Illinois and Southern Wisconsin with the heaviest falling Sunday night into Monday as the low moves closer. 6"- 12" will be likely area wide with a little more of a mix the further south of the Stateline. As it looks right now, the heaviest swath of accumulating snow will be from western Lee County, northern DeKalb County into McHenry County. But any shift in the track will cause a change in the heaviest snow band. Click here for a look at snowfall probabilities from the HPC. Please be sure to keep tabs on the forecast this weekend. Eric Nefstead will have a complete look at the forecast and break down all the details for you on-air as well as on the blog! Looking at the latest runs this morning - and snow will be likely Sunday night into Monday, but models are trending slower with the system pushing the snow more into Monday and Monday night. It is still too early to talk snow amounts, but accumulating snow will be likely. Eric Nefstead will have all the up to date information throughout the weekend. Two storms will bring us snow; one to start the weekend and the other to end the weekend. The one slated to move through tonight shouldn't be too much of a big deal. Anywhere between 1"- 2" will be likely. The second one, however, could bring a little more accumulating snow. Let’s start with the first. An area of low pressure currently east of the Rockies will swing through Central Illinois tonight and Saturday. As it does, an inverted trough (sea level pressure bulging north instead of south) will move through Northern Illinois. As this low moves off east, a second one will move in behind it. This one has the potential to bring a little more accumulating snow. With it being still off shore, we are having a hard time trying to pin down the track of the system. There are two scenarios playing out. Scenario number one has a surface low developing in Northern Texas moving into Arkansas and then into the Ohio River Valley. With this track, it would put the heaviest snow band through Central Illinois with snow likely for us. The second track brings the low further north and wraps in a little warmer air with it. In this scenario the heaviest snow band would be further north, but also gives us a rain/snow mix. We'll continue to watch this with each computer run. Morning models will be coming out shortly and as we continue to get closer to Sunday, we'll be able to pin down a more exact track. A volunteer cooperative (CO-OP) weather observer is needed in Dixon, IL. A CO-OP observer is the official National Weater Service weather observer for a community. The new observer will become a member of one of the NWS's nationwide volunteer networks. Observers take and record precipitation, both rain and snow, along with temperature readings. Click here for a more detailed description of the NWS CO-OP program. Visible satellite is really neat to look at because not only can it tell you where clouds or new storms systems might be developing, you can also use it to see where there is snow cover. The image on the left is a static image of the visible satellite from 11am. At first glance, it may look like there are clouds around but if we were to put it in motion you would notice the white over Illinois wasn't moving! Not only can you use it to see snow cover, but also ice that has formed on lakes. Click here for an animating image of both. Unfortunately, skies will cloud back up by Friday ahead of an approaching system currently in the Rockies. This one may be close enough to brush us with some light snow Friday night into Saturday. And then again with another system Sunday night into Monday. 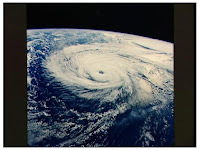 NOAA's National Weather Service will use a new hurricane scale this upcoming season called the "Saffir-Simpson Hurricane Wind Scale". While they will continue to use the same wind speeds for the five different categories, however, storm surge and flooding effects will no longer be tied in. You can read the compete article here. During the morning show I was challenged by WZOK's Steve Shannon to do a little dance in honor of Mardi Gras. Knowing that I can't turn down a challenge, I decided to take him up on that offer and well....I'll let you be the judge of my dancing skills! Sunshine will dominate through the late morning and early afternoon. Temperatures today will reach the upper 20s. An upper level disturbance will move south out of the northern Great Lakes this afternoon bringing with it a little more cloud cover and a few light flurries. Look for mainly cloudy skies tonight as we keep the flurry chance going until Wednesday morning. Once this disturbance moves through things will be pretty quiet until the end of the week. We're watching another disturbance that could work its way in Friday night and then again Sunday night. Just a quick reminder - Storm Spotter Training will take place next Tuesday, February 23rd at 7pm at the Public Safety Building at the Chicago/Rockford International Airport. Any questions: 815-319-6215. It's free to all and I encourage you to attend! I know it's hard to think about severe weather with all the cold but stop on by. You'll find a lot of useful information to help keep you safe during the upcoming severe weather season! It seems like we've been stuck in the same old pattern for the past couple of weeks with below average temperatures across the Midwest and record breaking snowfall out east. So what's the cause for all this weather. A persistent cold pocket of air has been in place across the Northeast as well as into the Great Lakes keeping temperatures from reaching above average. It has also allowed the main storm track to remain south of the Stateline - putting the southern states and east coast in its path. Storm systems develop as a result of the atmosphere trying to balance itself out and will typically follow the greatest temperature gradient. So with the cold air settled over much of the upper 48, storms have been bypassing the Stateline and heading straight for the east coast. Unfortunately it doesn't look like we're going to break this pattern anytime soon. The only good news is there doesn't appear to be any major storms within the next week. I know it's a little late but I wanted to do a recap of the Feb 8th and 9th snowfall. Overall, most of the Stateline saw anywhere between 4"- 8" between Monday night and Wednesday morning. Rockford picked up just a little over 7" in some spots, while others saw close to 9". 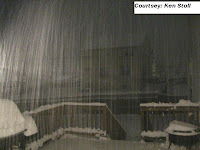 Snow began late in the evening Monday and continued until early Wednesday morning. Two storm systems were at play; one moving south from the northern Plains and the other moving north from the southern states. As the low moved into the Ohio River Valley, snowfall from lake effect resulted in over a foot of snow in the counties that surround Lake Michigan in Illinois and Wisconsin. 12.6" fell at O'Hare Airport breaking the old daily record of 8.9" set back in 1885, also making it the highest single daily total in February for Chicago since records started! Wow! As the low continued to move east, winds began to pick up late in the day Tuesday and continued into Wednesday morning. This caused blowing and drifting early on Wednesday before winds subsided Wednesday afternoon. Thankfully, no snow like that is in the forecast for the next week. Light snow showers are possible Monday but at this point, we're looking only at minor accumulations. The blog has been up and running for about a month and I want to know what you think of it. Do you find the information useful/educational? What would you like to see more of? Remember, we want you to stay up to date with the weather so if there's anything more you want, let us know! Thanks to light winds, clear skies and a fresh snow pack temperatures this morning fell in some spots below zero! Brrrr! Looking at the overall pattern through next week, there doesn't appear to be any significant warm up. Average highs this time of year range from 32° to 34°. Unfortunately, it looks like we will remain below average at least through the end of next week. Boo! 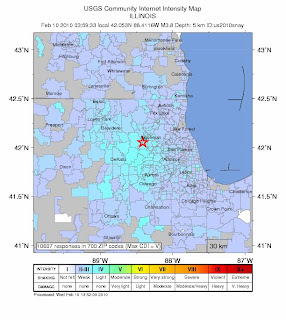 Preliminary 3.8 magnitude earthquake rattles northern Illinois at 3:59am this morning. The epicenter was near Pingree Grove, Il (in Kane County) which is about 40 miles WNW of Chicago. Calls starting coming in shortly after in the newsroom of people waking up to their beds shaking and pictures rattling on the walls. No reports of damage yet but the rumbles were felt all the way through Illinois and into Wisconsin. There is a fault line that runs through southern DeKalb county but after speaking with NIU Geology Professor Philip Carpenter during the morning show this one was likely not triggered by that . Let us know what it felt like for you! We want to hear your reports! Light snow continues to fall across much of the Stateline this morning. So far between 3" to the south and 6" to the north have fallen (for reports, see previous post). Lesser amounts to the south thanks to a little dry air trying to wrap its way into the storm. The upper low continues to spin through northern Missouri with a few breaks in the snow south of I-88. Light snow will continue through the day adding on a couple more inches. As I had mentioned earlier, snow/water ratios throughout the duration of this event will change ranging from 12:1 at times to 17:1 at times. As a result, the snow might not be as fluffy as it was earlier resulting in a wetter snow. This will be something to watch through the afternoon. Don't forget, we want your snowfall reports! Email them to weather@wtvo.com! For a view of current road conditions click here. Roads conditions now look to be either patchy with snow or completely snow covered. Be sure to take it easy out there! Roads will remain slick throughout the day. How much snow do you have? We want your snowfall reports! Leave them here on the blog or email: weather@wtvo.com. 12:17pm: 5.7" Rockford Airport - Winnebago Co.
11:30am: 4": SSE Shannon - Carroll Co.
11:17am: 3": DeKalb - DeKalb Co.
Just finished with the conference call with the National Weather Service - forecast is still pretty much on track. The upper low is really moving across the area and light snow will continue through the rest of the day before coming to an end Wednesday morning. There is still a lot of uncertainty as far as the snow/water ratio because of just how dynamic the system really is. Snow/water ratios will likely change throughout the life system of the low, making it hard to really try and pinpoint snowfall totals. I think the going 6" plus will still stick through the afternoon. One thing to note is when looking at the surface map, temperatures in northern Illinois are sitting in the 20s but further to the south and southwest temperatures have fallen back into the single digits. This may actually allow what we call frontogenesis (basically a front) to form and could add a little extra lift which may enhance snowfall totals as the low rotates through. Something we'll have to monitor throughout the day. 10:30am: Winter Storm Warning is cancelled for the counties of Jo Davies, Stephenson, Carroll and Whiteside counties. A Winter Weather Advisory has been issued for those counties until midnight tonight. 9.:33am: 3.5" 1 mile WNW Morrison - Whiteside Co.
9:30am: 4.6" 4 miles NNW Lanark - Carroll Co.
9:28am: 4.0" SSW Stockton - Jo Daviess Co.
9:20am Update: Looking at some of the snow totals that are coming out of Iowa right now and a lot of them are reaching the 6" mark already! Moderate snow is falling over Rockford right now as the upper level low continues to deepen and move through northern Missouri. Will be participating in a conference call with the National Weather Service in about 45 mins. 7:00am: 3" Milton - Rock Co.
6:40am: 4.0" in Freeport - Stephenson Co.
6:30am Update: About 2"- 3" of snow has fallen overnight and will continue to fall throughout the day. The going forecast of 6"- 10" still looks on track by Wednesday morning. Forecasting this system has been very interesting. This is more of an upper level system than surface one and with that the dynamics of the storm will be changing throughout the day. Trying to forecast snow/water ratios have been a little tricky. Typically we would expect a 12:1 ratio with this type of system. But what we're seeing this morning is more of an influence of warmer air being drawn in. That will begin to diminsh as the upper level low moves through southern Illinois and more of a synoptic set up takes place. With the low to the south of us, a band of moderate snow may set up through North Central Illinois. The snow is light in nature so as winds begin to pick up later today blowing and drifting will be the primary concern tonight and overnight. Take it easy out there! 6:00pm Update: Going forecast still looks on track. Light snow will continue to fall through the evening and into the overnight. Snow will continue throughout the day Tuesday with the heaviest falling during the afternoon and evening. Update: Winter Weather Advisory has been updated to a Winter Storm Warning for all counties in northern Illinois and southern Wisconsin. See post below for additional information regarding winter storm. Parts of the Mid-Atlantic received record amounts of snowfall last week and are in line to receive more later this week. While accumulations aren't expected to be anywhere near what they were last week, it will almost act as "salt in an open wound" so to speak since they are still trying to deal with the clean up. A big Thank You to Ken from Rochelle for sending me these pictures this morning taken by his son who lives in Winchester, VA. Over 2 feet of snow fell around that area! Makes our 6" look like peanuts! 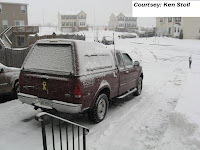 Notice the before and after pictures of the truck and how the snow looks as it comes down. Simply amazing! 2:30pm Update: Just finished conference call with the NWS - Advisory for the Rockford area will likely be upgraded to a Winter Storm Warning. The reasoning will be the impact the snow will have Tuesday into Tuesday evening; the long duration of the event along with the blowing and drifting that is likely to take place Tuesday evening. Everything still looks on track forecast wise with 6"- 10" likely. Trying to pinpoint an exact snow/water ratio will be difficult with this system because the thermal profile of the atmosphere will likely be changing throughout the event as the upper low rotates through the Great Lakes. With warmer air wrapping into the system we could get an enhanced area of snow which would likely get us closer to the 10" mark Be sure to keep checking back for the latest information. Paul will have your complete forecast tonight starting at 5pm. 2pm Update: Getting ready to conduct a conference call with the National Weather Service. Noon update: Looking at the latest computer runs this morning we're still in fairly good agreement with the snow. Backing off a tiny bit on precipitation amounts but I think a running 6" will be likely for the Stateline with some higher amounts possible. Light snow will probably be here around dinner time (5-6pm) with moderate snow falling during the overnight and into Tuesday afternoon. Snow will last throughout the day Tuesday before coming to an end Wednesday morning. Tuesday morning may be a rough commute as well as Tuesday evening with the blowing and drifting expected to take place with gusty north winds. All WTVO viewing counties in northern Illinois and southern Wisconsin are under a Winter Weather Advisory beginning this evening and lasting through Wednesday morning. Winter Storm Warnings have been issued for counties closer to Lake Michigan. Light snow that moved through early this morning has now pushed off to the east leaving mostly to partly cloudy skies in its wake. Snow will begin late this afternoon and evening as two areas of low pressure, one currently in northern Iowa and the other moving into Oklahoma, combine this evening, track through southern Illinois and then into the Ohio River Valley. As it passes to the south the low is expected to deepen overnight and into Tuesday bringing the bulk of the snow to Stateline during that time frame. Snow is then expected to last throughout the day Tuesday before moving off to the east Wednesday morning. Snow accumulations will add up because of the fluffy nature of the snow as well as the long duration of the event. Computer models from last evening are still wanting to put out close to a half an inch of precipiation over the next couple of days. That would yield us right around the 6" mark. There may be some embedded higher amounts as the bulk of the snow falls into Tuesday. Once the low passes to the east, winds will begin to pick up from the north creating the next concern of blowing and drifting. Temperatures as a result will stay below average through the remainder of the week. Morning computer model runs should be coming out shortly so we'll continue to keep you updated as we get new data in this morning. An area of low pressure will begin to develop in the southwest Monday and move into the Ohio River Valley by Tuesday evening. As it does, it will draw in moisture from the Gulf of Mexico and combine with an upper level disturbance currently moving south out of Canada through the northern Plains. Because temperatures will be somewhere in the mid to upper 20s, forecast snow/water ratios will be a little higher than the typical 10:1 - closer to 15:1. This will allow the snow to fluff a little more. Current precipitation amounts coming out of some of the models are suggesting over a half an inch of precipitation. That would yield us over 6 inches of snow. Some of the National Weather Service offices are suggesting close to 10 inches by Wednesday morning. As the low pulls off to the east Tuesday night and Wednesday, winds will become very gusty in its wake so blowing and drifting will then become the concern. Eric will have an update on the forecast during the newscasts this evening and Candice will have an update Monday morning. It looks like the heaviest of the snow will fall Monday night into Tuesday. Be sure to keep checking back for the latest. The radar returns this morning were indicating snow was falling but nothing was reaching the ground yet. The reason for that, east winds and dry air in the mid levels of the atmosphere (roughly 1000 to 3000 ft). Looking at the thermal profile from Davenport we can see that the dew point is very dry so any precipitation that falls within that layer will likely evaporate before reaching the ground. The first image on the left is the sounding from Davenport for last night. The line on the left is the dew point profile all the way up through the atmosphere, while the line of the right is the temperature profile. Without getting into too much detail, temperature is on the bottom (the blue numbers and in °C) and the height is on the left. Notice how the dew point line at about 900mb falls back to -20°C. That's dry air! Now, look at the second image from the sounding this morning. Still from Davenport, notice how the dew point line is much closer to the temperature line. This means that the atmosphere is now beginning to saturate and snow will likely be able to reach the surface, but it will take awhile. At the onset, it may actually mix in with a little sleet because there is a slight warm layer aloft. Accumulations won't amount to much for today. Temperatures will stay in the low 30s for this afternoon. Survey Says...It's going to get cold next week! We've been semi-spoiled the past couple of weeks in the temperature department. Sure we had a couple days where highs were in the teens but overall not too bad. That will all be changing as the weekend and next week approach. Whenever I forecast I always like to see what temperatures will be above the surface, typically around 850mb (or roughly 1500 ft up). That will usually give me an idea if any warm or cold air will be moving into the forecast area. Looking ahead into next week it doesn't look like we will be seeing a warm up anytime soon. Temperatures look to stay below average through a good part of the week and possibly into next weekend! Click here to see a looping image of the temperatures ( in degrees celsius) at 850mb. The loop begins Tuesday night and runs through next Sunday, the 14th. It runs every 12 hours: 6am and 6pm. The darker pink and purples indicate the cold air coming in from northern Canada and notice how it pretty much stays in place for the next 10 days. We really don't see any big warm ups anytime soon! Snow will be likely Friday but the big question earlier in the week was just how much would we see. Meteorologists use many different tools to help them forecast and one of those tools are computer weather models. The images on the left are snap shots of the NAM (North American Mesoscale) model and the GFS (Global Forecast System). Both are showing the same time frame, Friday at noon. But notice how the NAM doesn't have any precipitation over the Stateline while the GFS does. So why is that? Even though there are several different types of weather models out there, they all don't use the same parameters. In this case, the NAM is taking into account the east wind and dry air and how that will have an impact on the snow accumulation. The GFS, however, isn't factoring that in as much and wants to bring the snow further northward. Sometimes the GFS has a tendancy to "overdue" precipitation amounts a little and while I do think we will see snow Friday, the bulk of it will stay to the south with 3"- 6" south of I-88. For us - wouldn't be surprised if we picked up 1"- 3" with lighter amounts to the north. Of course, if we see any deviation in the current track of the system that could yield a different outcome for us. But as of right now, it doesn't look like we should see anymore than 3" by Saturday morning. Show your fellow weatherman, or woman, some love! It sure was a different sceen when you woke up this morning. While this wasn't a major snow storm by any means, it was enough to cover the grass and roads this morning. Overall anywhere between 1.5" and 2.5" fell across the Stateline. The Rockford Airport picked up about 1.5" while here at the WTVO studio it was close to 2". The forecast yesterday called for 1"-2" with higher amounts north of Rockford and lesser amounts south and for the most part that verified. Wanted to say "Thank you" to Sandy, who lives just south of Rockton, who measured the snow on her picnic table this morning and had 3" there! We'll get a break from the snow for the next couple of days but could see some more return for the weekend. Well, it's official - Punxsutawney Phil SAW his shadow this morning and that means 6 more weeks of winter! Yikes! Although when you look out the window this morning I'm sure you didn't need a groundhog to tell you that! Most areas have picked up around 1.5" so far so we're still on track to reach 2" by the time it's all said and done. Light snow will continue this afternoon with a few flurries overnight. After a weekend with mostly sunny skies the clouds were quick to thicken across the Midwest ahead of our next storm system currently in the Plains. A shortwave (area of low pressure in the upper levels of the atmosphere) is currently moving through the Plains this afternoon and will cross over the stateline later this evening and overnight. As it does, snow will begin to fall and continue through Tuesday morning. This system is mainly upper air driven so there currently isn't a lot of moisture with it so totals look to range anywhere between 1" to 2". The further south of the Rockford metro area totals could be a little less and the further north/northwest totals may range closer to 2.5". It will probably be enough to slicken things up on sidewalks and steps. High pressure will try to build in Tuesday night and Wednesday but clouds will hang around for a good part of the week. The good news is that we won't see any major blasts of arctic air behind this system. Temperatures are expected to remain fairly close to the average high: 29°.